Kids catch on to these things so quickly! I only started using these videos last week and I'm already using them as a reward, transition in between subjects, brain break, a little movement, and get happy dance! (I'm not in the video...someone had to film!-ok, maybe next week!) There's dozens listed on YouTube, go check out your favorite! 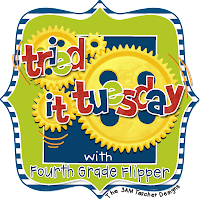 Head on over to check out all the great ideas at one of my BBBs Holly's Tried It Tuesday-there's something for everyone! So fun, I love doing brain breaks...I may have to try one of these tomorrow! This is going on the list for end of the year stuff! We still have the rest of this week and all of next week to test and then the fun can begin! Thanks for sharing! Love the video of your class! That is our favorite song to do!! Thanks for the shout out. Can't wait to see the video with you dancing - maybe next week ; ). Maybe our classes could be dance buddies - like pen pals, just with music and dancing instead!! I still need to try this! Maybe tomorrow when they will be crazy anyway on the last day of school! That will be a great way to end the year! Thanks for reminding me! My students love these, too. We use them a couple times a week for brain breaks. They catch on to the movements so quickly. These videos have to be so fun and such a great way to re-energize your kids-- I'm thinking we should add these in to our "workout wednesday" videos! Thanks for the idea!